My desire is to share websites, authors, musicians, teachers, happenings, etc. that inspire us to go towards the light and healing. We are all ONE and I invite you to share with us the "who", "what", "where" which inspires you to "breathe into the light." At times we struggle in quiet desperation thinking that the woman next to us is "better off.” We ALL have stories that we carry. Let's all focus on lifting one another to a brilliant place transforming quiet desperation into rapturous joy. The pause, breathe, stillness, etc., etc. I got a nice reminder today about the power of Rest. We all KNOW how important it is to Rest, but RARELY do we make it a priority in our lives. I KNOW I don't. This week I was even told by an accupuncturist that my chronically sore left shoulder is telling my body that I need rest, but I have heeded his advice yet? Not really. As my husband said to me, " If your doctor told you to stop smoking and drinking, but you kept drinking, you would not be following his advice." From the author's perspective God created night first, then morning. Rest is the priority, so we have the energy to greet the morning. Huh...could it be that simple?! Maybe? Often the thing in the way comes from another person; a stubbornness falls like a tree blocking where we want to go, or a sadness comes like a flash flood to muddy the road between us, or just as we go to rest in the clearing we have prepared, we are bitten by something hiding in the undergrowth. Thus, in daily ways, we have this constant choice: to see each other as the stubborn, muddy, biting thing that blocks our way, or to back up and take in the whole person as we would a mountain in its entirety, dizzy when looking up into its majesty. When we are blocked in our closeness with one another, we have this constant opportunity: to raise our eyes and behold each other completely, then to kneel and lift the fallen tree, or cross the flooded path, or pluck and toss the biting thing. We have the chance to keep climbing, so we might cup the water that runs from each other, so we might quench our thirst as from a mountain stream, knowing that love like water comes softly through the hardest places." BEHOLD EACH OTHER COMPLETELY...envisioning the power, the sacredness of the word BEHOLD allows me to stop and appreciate the sacredness and beauty that exists within all; it's just sometimes in the stubborness or sadness that we lose our way of "being" authentic in this world. We forget who we are.BEHOLD...when this word is used, it conjures up an image of something or someone so spectacular that it takes one's breath away. How would the world be if we were able to use this word more often? "The word for today ... FORGIVENESS. Forgive the thoughts that say you are separate and alone. Forgive the thoughts that say you are not enough, or don't deserve love. Forgive the silent patterns that keep you in resistance or fear. Forgive, forgive, forgive. And then forgive again. The entire day breathing forgiveness into yourself, into every situation, into the world." WOW!! My friend posted this on her Facebook page today...Forgiveness is an on-going theme in my life over the past few months and it is sooo damn hard... gentle reminder of the call to live from the heart. Tomorrow I am going to try to breathe forgiveness; inhaling and exhaling forgiveness all day long...perhaps it will bring me closer...can't hurt.. So the wisdom of the Divine continually shows up in my life. Today I opened The Book of Awakening by Mark Nepo to read aloud a passage in one of my yoga classes. It is entitled, Burying and Planting. "The culmination of one love, one dream, one self, is the anonymous seed of the next." "There is very little difference between burying and planting. For often, we need to put dead things to rest, so that new life can grow. And further, the thing to put to rest-whether it be a loved one, a dream, or a false way of seeing-becomes the fertilizer for the life about to form. As the well-used thing joins with the earth , the old love fertilizes the new; the broken dream fertilizes the dream yet conceived; the painful way of being that strapped us to the world fertilizes the freer inner stance about to unfold. This is very helpful when considering the many forms of self we inhabit over a lifetime. One self carries us to the extent of its usefulness and dies. We are then forced to put that once beloved skin to rest, to join it with the ground of spirit from which it came, so it may fertilize the next skin of self that will carry us into tomorrow. There is always grief for what is lost and always surprise at what is born. But much of our pain in living comes from wearing a dead and useless skin, refusing to put it to rest, or from burying such things with the intent of hiding them rather than relinquishing them. For every new way of being, there is a failed attempt mulching beneath the tongue. For every sprig that breaks surface, there is an old stick stirring underground. For every moment of joy sprouting, there is a new moment of struggle taking root. We live, embrace, and put to rest our dearest things, including how we see ourselves, so we can resurrect our lives anew." "So we can resurrect our lives anew..." A most powerful line, as a resurrection is a miracle; the ultimate symbol of hope out of despair. Perhaps the most powerful stanza for me is the one I bolded. How many times have I hidden rather than relinquished; how many times did I avoid because I thought it was too painful to feel or I was too scared to face the reality of my experience or my Truth. I feared my world would be shattered; there would be no safety in the unknown. I would stay in painful relationships because it was what I knew;it was familiar. I didn't know or understand that I could experience different or perhaps better. Now I know I can; I know I HAVE to. To face the truth about myself or others is not always comfortable or easy, but self-compassion and Grace goes a long way. The alternative of holding onto a life of falsity is no longer possible when I know there is the hope of a resurrection with a life anew waiting for me. I invite you to bury and plant this week a part of your life or yourself that no longer serves you with Self-compassion and Self-love. If you are so moved I would be grateful to hear from you or feel free to share. Breathe Into The Light: Check this out!! We’ve all been hurt, disappointed, betrayed, maybe even abused. Sometimes the perpetrator is someone we love; at other times it may be an institution such as our employer or our government; still other times, we mistreat ourselves. But regardless of the source of our pain, we instinctively react with aversion—both as individuals and as communities. Our anger and blame help us to feel in control and motivate us to eliminate the threat. We yell at our spouse or our co-worker. We punish ourselves. As a nation, we declare war on the enemy. The Buddha taught that although such reactions are natural, at best they provide only temporary relief, and inevitably they fuel further reaction. As with all other phenomena, the Buddha suggested that we meet violence with an accepting, compassionate presence. But for many of us, the question immediately arises: Does this mean we should buckle under and accept the person who has betrayed us, accept those who make war or destroy the environment in our name, accept our own addictive behaviors? Such acceptance might even seem unethical—as if we’re supposed to simply stand back and watch harmful behaviors unfold with a detached eye. In a recent magazine interview on my book Radical Acceptance I was asked, “As a peace activist, how do you reconcile acceptance with a world that is violent and filled with suffering?” That’s a good question, because it points out a misunderstanding about what Radical Acceptance means. Radical Acceptance does not mean allowing someone to harm us or to injure themselves. It does not mean that we endorse war. Rather, Radical Acceptance is the capacity to recognize clearly what is happening inside us in the present moment, and to meet what we see with kindness. We accept our own experience of the hurt or fear or anger that arise in reaction to an external circumstance. Only when we do so can our decisions and actions be guided by a wise heart. This past year, reading the newspapers was for me a regular source of dismay, blame and anger. I felt outraged at individuals in power who made decisions that I believed directly caused suffering. I blamed them for deception, for not caring about the consequences of their aggression. But when I remembered to practice Radical Acceptance, the experience was very different. I would pause, stop reading and ask myself what was happening inside. I’d note the swelling pressure and heat of anger in my body and just allow it to be there, without judgment. Deepening my attention, I would invariably experience the grip of fear—fear for our world, fear of how violence and misunderstanding is proliferating, fear about how we are devastating our natural habitat. As I continued to offer a gentle presence, fear would gradually give way to a tender caring about life. Now I could resume reading and, instead of reacting with righteous anger, I was more inclined to respond to the headlines with compassion. Practicing in this way allows us to see more clearly what we have been reacting to. We see that when we blame, we’re caught up in a narrative that necessarily includes a villain. Yet there is no single person or group of people responsible for causing suffering. Harmful behaviors are driven by ignorance—by fear, greed or hatred. When we realize this, instead of casting blame we are freer to respond with understanding and forgiveness. But, releasing blame and accepting our experience does not mean we become passive observers. When we allow ourselves to feel the reality of suffering, a deep caring arises. Last spring, this caring led a group of us to form of the Washington Buddhist Peace Fellowship. Caring, not anger, was the spirit that propelled our interfaith peace walk. Caring, not blame, inspired some of us to get arrested as an expression of our concern over the war in Iraq. Many of us reserve our deepest blame for ourselves. Here, too, it is ignorance—the perception of being a defective, unworthy self—that gives rise to our most troubled behaviors. If we binge on food or alcohol, and the next day punish ourselves with thoughts and feelings of self-hatred, this just fuels another round of addictive behavior. If instead, we can accept our experience with kindness, we begin to break the inner cycle of violence. This doesn’t mean we give ourselves permission to continue to act in harmful ways. But we don’t condemn ourselves either. Instead, we identify exactly what we’re feeling in the moment—physical discomfort, shame, remorse—and meet our experience with a kind attention. As we do so, our sense of identity grows beyond a “flawed” self, and we begin to trust our essence as compassionate awareness. We gradually become more responsible—more able to respond wisely to our present circumstances. 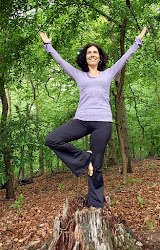 I am a yoga teacher, wife and mom, who has a desire to share inspirational resources with other women.